Anthony Fieldhouse & Co Ltd are specialist Party Wall Surveyors based in Ealing, West London. We have over 25 years experience in assisting residential and commercial property owners in resolving Party Wall Matters and provide a prompt and professional service. 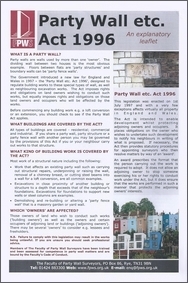 Acting on behalf of both Building Owners and Adjoining Owners we offer guidance through the Party Wall Notice, Award and Dispute procedures. If you are planning a loft extension, rear extension, basement conversion or any other building works and excavations close to or affecting a shared or party wall, or if your next door neighbour is, then please give us a call and we can act on your behalf. Concerns about construction next door? "We would recommend the services of Anthony Fieldhouse & Co and would have no hesitation in instructing them in future." Mrs ED.Harrow, Middx. October 2012. Commercial property in Harrow.